The Rectus femoris muscle is one of the four quadriceps muscles. It is located in the middle of the front of the thigh. It is responsible for knee extension and hip and thigh flexion. It is the main muscle that can flex the hip. The rectus femoris attaches from the pelvis to just below the knee (on the patellar tendon.) 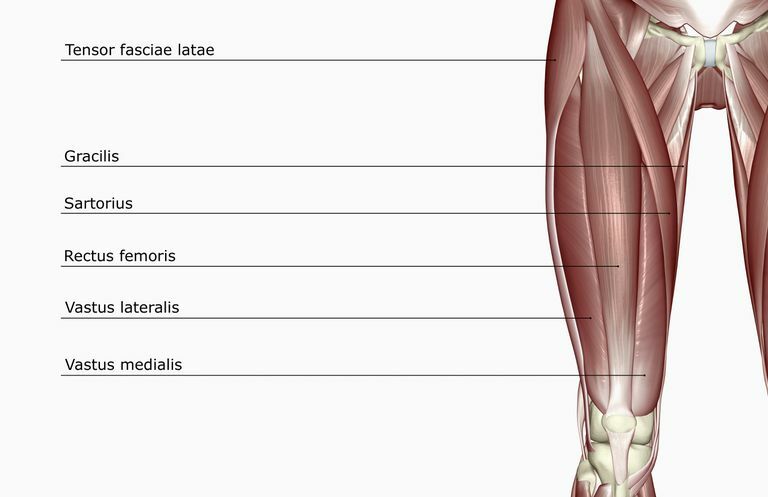 The other muscles of the quadriceps include the vastus medialis, the vastus intermedius, and the vastus lateralis. The rectus femoris muscle has two heads. The straight head has its origin on the anterior inferior iliac spine. The reflected head has its origin on the ilium, above the acetabulum. It has its insertion into the patellar tendon at the patella of the knee. It is fed by a descending branch of the lateral femoral circumflex artery. It is enervated by the femoral nerve. In sports, the rectus femoris is used powerfully when you kick a football or soccer ball. It is also used in cycling. It is considered one of the muscles that make up the hip flexors; a group of muscles that bring the legs and trunk together in a flexion movement. It also extends the leg at the knee. It can extend the knee powerfully when the hip is extended. But if the hip is flexed, such as when you are sitting, it is weaker in extending the knee and the other quads have to do the work. The same is true if the knee is extended; in that case, it can only flex the hip weakly and the other hip extensors have to go to work. The synergist muscles for the rectus femoris are the gluteus maximums, piriformis, obturator externus, obturator internus, and the superior and inferior gemelli. The hamstrings are the antagonist muscles to the rectus femoris. They produce the opposite action. You can have a strain by overuse of the rectus femoris in sprinting or kicking, and you may feel pain in the groin. You may also feel pain when walking downstairs. Acute tears or strains can happen in activities such as jumping, sprinting or kicking, and these usually happen at the patellar tendon. You might feel a sharp pain extending to the knee or be unable to fully straighten the knee. Sitting too much can tighten and shorten the hip flexors, as can wearing high heel shoes. Enjoying running and fitness walking develops the hamstrings, the antagonist muscles to the rectus femoris, and you can have a relative imbalance if those are your chief physical activities. Squats and lunges, both simply with your body weight or with barbell or dumbbells will exercise the rectus femoris. Machine exercises include the leg extension and upright leg press. If your chief cardio activities are walking or running, it is good to include exercises for the quads in the rest of your fitness program.